The day Katie and I found out that we had landed the Coffee + Crumbs podcast host and producer gigs was the very same evening we had met Jamie Ivey at her Atlanta book signing. That night, I was unable to sleep. The news of the new job, the 8 pm East Pole caffeine percolating in my blood, and the high I get from being around a lot of people made slumber impossible. So I did what I usually do on sleepless nights: I grabbed my phone and opened up Buzzfeed. Ha! But then I remembered that I had a new book, so I put down the phone, turned on my reading light, and started to read. If You Only Knew was just a couple hours fresh in my hands, but I devoured it. Initially, it was to prepare for Jamie being on Coffee + Crumbs, but six pages in, I found myself gobbling it up because my pulse quickened. Her story, because it's God's story of redemption in her life, resonated with me. 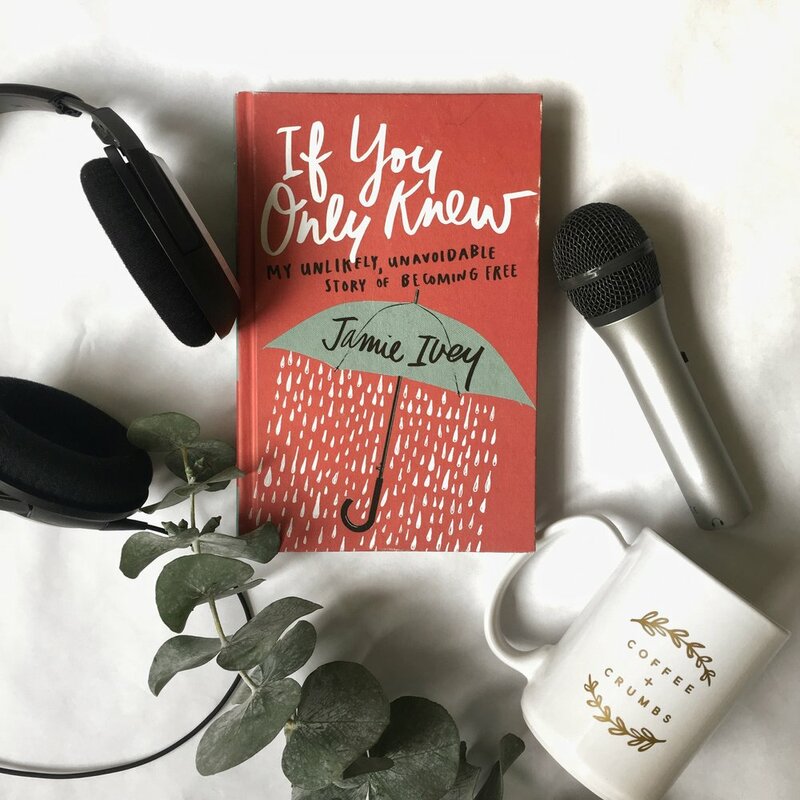 Jamie contends that we all have these "if you only knew" things about us. Things that are blemishes in our lives. Things we're not proud of. Things we silently tie to our identity yet tuck under the thick sweaters of our lives-- close to our hearts, desperately trying to hide it, but yet it's there poking out from under the surface, always making us slightly uncomfortable. In today's episode I ask Jamie some poignant questions, but not once do I come close to letting the listeners in on my own "If You Only Knew" moments. In fact, I boldly state that in light of my upcoming 20th class reunion that "Adult Indiana does a pretty good job at keeping high school Indiana's past under wraps". But the truth is, I do a pretty good job at keeping all my sins and struggles and shame under wraps. From high school, yes, but especially recent things-- things I'm still trying to reconcile and heal from today. Instagram and blogs and podcasts are a funny thing, aren't they? I feel like I write pretty candidly within those mediums, but I recognize that the life I live in those online spaces are tiny snapshots of my highlights. that my marriage is marred by huge missteps and long seasons of strife and distance and doubt. that I struggle in motherhood and find myself losing my temper more often than I'm comfortable admitting. that I carry some fresh and deep self-inflicted wounds from broken friendships and misplaced hope. that I always feel like an outsider. So, friends, despite the fact that in general, I'm a ridiculous person who tends to tell the lighthearted stories in my online spaces, I need you to know that I carry "if you only knew" moments around with me. And I know that you carry those around, too. And here's the truth: My story is still being written. In some parts of the story, I'm the villain. In others, I'm the bumbling fool. Only sometimes do I get to be the comic relief. But this is important: I am never the hero. God is. It is my prayer that you and I can hold our past rightly. Not in a dark place where we pretend it never existed, but also not clutching it so tightly that we can't grab on to bigger, better things-- like hope and healing and the promise of all things being made new and right. If I learned anything from Jamie's book or through my interview with her, it's that we all need friendships and marriages in which we can share our "if you only knew" moments and that the conversation doesn't stop there or with a glass of wine or the promise of "you'll feel better after a night of sleep". The conversation, in gospel-centered relationships, continues as our friend grabs our hand and walks alongside us in the truth that Jesus is telling us "I know everything about you and I love you."